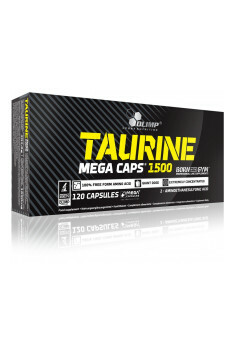 OLIMP Taurine Mega Caps® 1500 is a dietary supplement which contains taurine. Each capsule comprises a massive, effective dose of this substance. The formulation is used readily by athletes. It enhances training performance, helps increase the body’s endurance and speeds up recovery after intense physical activity. What is more, it may improve the overall health – it boosts glucose metabolism, supports nervous system function, strengthens the heart and has anti-inflammatory and antioxidant effects. Taurine, otherwise known as 2-aminoethanesulfonic acid, is a substance which belongs to non-proteinogenic amino acids. It is synthesised in small amounts in the body from two other amino acids – cysteine and methionine. It is assumed that the rest should come from a diet. Large quantities of taurine can be found in the brain, retina, skeletal muscles and cardiac muscle. It is involved in many important physiological processes and its deficiency usually correlates with diseases. Taurine helps increase strength and endurance. Among physically active individuals, it is treated as a training booster. Many studies showed that athletes in various sports taking taurine supplements had improved exercise tolerance and performed longer and harder exercise sessions. Scientists stipulate that the main mechanism of this action is associated with anti-inflammatory and antioxidant properties of taurine. This may be also connected with its role in the maintenance of calcium homeostasis in skeletal muscles. Taurine accelerates post-workout recovery. It beneficially influences carbohydrate metabolism and speeds up the replenishment of glycogen stores which were depleted due to strenuous exercise. In addition, it helps maintain a positive nitrogen balance, which is crucial especially to anabolic processes and protection against muscle tissue breakdown. Along with BCAAs, taurine helps reduce muscle soreness after a hard workout. Taurine positively influences the cardiovascular system. It is important especially for healthy cardiac function – it stabilises the heart rhythm, increases the strength of cardiac contraction and protects against myocardial dysfunction. What is more, it helps normalise blood pressure and optimise the lipid profile. It also aids in maintaining adequate levels of homocysteine which is a crucial factor in the development of atherosclerosis. Taurine reduces the risk of eye diseases. Its large quantities can be found e.g. in the retina. Degenerative changes in retinal ganglion cells are often caused by taurine deficiency. This increases the risk of developing cataract and incidence of diabetic retinopathy in diabetics. Furthermore, taurine protects delicate eye structures from damage caused by free radicals. Taurine promotes well-being. In terms of activity, it can be classified among neurotransmitters, but it does not have specific receptors. It affects in turn GABA-A receptors and that is why it has a soothing effect on the nervous system, promotes relaxation and helps achieve mental peace and maintain emotional balance. It may also strengthen memory and cognitive functions. Taurine reduces side effects of excessive caffeine consumption. Because of that, it is added commonly to energy drinks and pre-workout supplements based on stimulants. Taurine helps you feel it stimulant effects and protects against a sudden drop in energy and excessive nervousness and irritability, which occurs sometimes in high doses of caffeine. To sum up, OLIMP Taurine Mega Caps® 1500 is a perfect supplement for physically active persons. It contains an adequate, effective dose of the active substance. It has a beneficial effect on physical performance and post-workout recovery. It may also improve the overall health. 1-2 capsules a day depending on effort intensity or otherwise after consulting a dietician or doctor. The supplement comprises a large dose of the active substance. Because of that, you can feel its positive effects just after taking the dose recommended by the manufacturer, i.e. 1 capsule daily. Higher doses are also safe, but there is no clear evidence that they are more effective. Taurine works perfectly in combination with creatine and BCAAs. It is also recommended to individuals who consume high doses of stimulants. It is worth emphasising that energy drinks should not be treated as a source of taurine. In order to experience therapeutic effects, take pure taurine in powder or capsule form. Reverses aging on the cellular level; promotes the replacement of old cells with new ones.